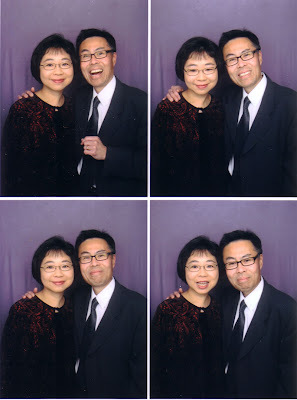 We spent much of Saturday (January 2, 2010: 01-2-10) at a wedding and the dinner reception that followed. Our choir director got married to one of our church's pastoral interns. I think this is probably the first wedding I've attended in which the bride and groom were young enough to be my kids! Oh my, just another sign of getting older, I guess. I actually do kind of look upon SJ (the bride and our choir director) as sort of a daughter because of that age difference. During the ceremony I was thinking it may not be that long from now when Greg and/or Katie are walking down the aisle. The reception was held at a Chinese restaurant and with about 400 guests, they took over the entire place. There was a rented photo booth where guests were invited to snap a set of 4 pictures. Two sets were printed, one to paste onto scrapbook pages for the newlyweds, and the other to keep. That was a nice idea, one that I had never seen before although we haven't been to very many weddings. There was the usual tapping of the silverware (well, actually plasticware since there were chopsticks and not forks or spoons) on the glasses to signal that the guests expected the newlyweds to kiss. This time, however, the emcee threw a wrench in the proceedings. He held up a bag and said it contained the names of twenty couples, chosen at random. Each time the tapping on the glasses occurred, he would draw a couple's name from the bag and they would have to come up front and kiss; the newlyweds would then have to stand up and kiss in the same manner. That was a novel approach to an old custom.. as well as one that caused much fear and anxiety in all of us! I would liken the anxiety that built up as the names were called out as no less than finding out what your draft priority number was back when the draft was in effect. Potential cardiac arrest twenty times in one night!! Well, luckily we escaped unscathed, as did everyone else at our table. All in all, the food was good, the company was good, the ceremony and festivities were fun, and it was a great way to begin the year. I have to tell you, it was such a refreshing change of pace from the receptions we get exposed to when going for our Saturday night Chinese dinners with Julie's side of the family. Often part of the restaurant will be reserved for a wedding party and there is plenty of very loud music (with that annoying bass thumping) and horrible, horrible singing. Saturday's wedding was much nicer! Yes, a great way to begin 2010. Nice photos. I would have love to be one of the selected couples.